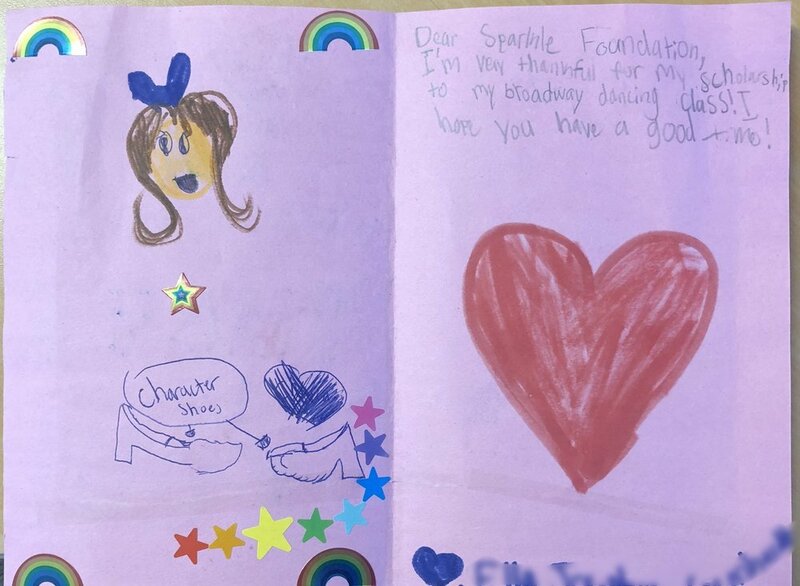 Our Impact — The Sparkle Foundation, Inc.
"I am forever grateful to the Sparkle Foundation for their help in getting my daughter to participate in dance. Being in such an affluent community where many families are able to travel, kids are in various activities, and families have big homes, my daughter has often felt "left out", but being in dance, her talent really shines! To top it off, she was able to perform on stage at the Marin Center- a big preparation towards her dream of performing on Broadway. This small gift and opportunity has made an enormous impact on my young daughter's self-esteem and in realizing her lifelong goals." "I nominated someone very special to me to be the recipient of the Sparkle Foundation's holiday gift giving. This person is near and dear to my heart. She is a hard working mother of young children, and she is also helping to raise one of her nieces. She is technically married, but has lived apart from her husband for many years. She does not receive any financial assistance from him. She is afraid to go forward with a divorce or pressing him for child support because her immigration status is reliant on their marriage. This woman works every day to put a roof over her head and somehow (barely) make ends meet for her children. She gets no rest and relaxation. She gets no time off from working and being a mom. She always has a smile on her face and she is always looking to do nice things for other people. She does not complain. She does not blame her situation on anyone else. She does not ask for help and she does not expect handouts from anyone. She just keeps her nose to the grindstone and puts in 110% effort to giver her kids a good upbringing. I do a lot to help this woman and her children, but I am only one person. There is a limit to what I can do. I nominated her for the holiday gift drive without telling her and crossed my fingers. When I found out that she was chosen as a recipient of the holiday gift program, I was elated. I could not wait to hear about the amazing Christmas celebrated by her and her children. This was not a couple of gifts for each family member. This was an absolute avalanche of beautiful gifts for this family. I was completely overwhelmed at the generosity and display of giving. This family was also completely overcome by the experience. My friend was so thrilled to be able to provide such a special holiday season to her children and her niece. The children were giddy with excitement and appreciation. The holiday season was very special for family and for me ... thanks to the Sparkle Foundation, their hard work, their amazing donors, and this community that we live in. " You helped us at a time we needed help the most, and you gave us Christmas. In the Fall I was diagnosed with breast cancer and had a double mastectomy. I was constantly going back and forth from appointment to appointment until my surgery and then again after surgery. Long story short, things became difficult for us. During this time, I wasn’t even thinking of Christmas, I was so wrapped up in my diagnosis and treatment. Had the Sparkle Foundation not chosen us, I don’t know what would have happened to Christmas. When we were notified by the Sparkle Foundation that Christmas was going to be delivered to us, all I could do was cry; I couldn’t believe what was happening. Then, oh my goodness, you came to the house, not with one bag, not with two bags but three bags of wrapped gifts, gift baskets, and a bike - I could believe my eyes. I cried again. Everyone who came to the house that day were incredible. I can’t even express in words how grateful and blessed we felt. The gifts were perfect; my daughter got everything she wanted and more. The gift baskets just keep giving and giving and we are still using some of the house cleaning and personal hygiene items today. Then after all of this, we get another email about the Photo Shoot that Shanti Wilson gave to each family. Yet, another gift that is still giving. My story doesn’t stop there. Things have continued to be challenging for us since my diagnosis. In the Winter I nominated my wonderful daughter for an enrichment scholarship. The Sparkle Foundation, again, came through for us. This time you have provided something that was so needed and really important to my daughter. Not only did you help her to not be impacted by our difficult times and lose access to something that means a lot to her, but you are helping her to stay focused on being a child, when all she wants to do is be an adult and help me through my cancer diagnosis. The Sparkle Foundation is a fabulous organization and they have impacted our lives incredibly. We will never forget them and hope to get involved when things start to stabilize for us in the future. Everyone involved truly give from their hearts and the giving doesn’t seem to stop. We THANK YOU from the bottom of our hearts. Helping daughters twirl and tap! "As a single mom to 3 girls full time, it is a fun adventure that I feel blessed to have. I was raised here in a working class family and I am working class too. But the crazy bit about the Bay Area now is that salaries just barely cover mortgage and groceries. Thank you for helping me to allow Ella to twirl and tap." "[Miss F] has 'Paid It Forward,' as your philosophy purports, her entire life, and particularly her professional career....She is presently financially challenged due to her decreased income because of the effects of the [the disease]." "I have just had the most incredible Christmas that I have ever had thanks to you and your organization. Watching my grand children's eyes as they opened one present after another - turning to me and saying "can I open this one too" - brought joy to my heart like I have not felt since I was told that I had ALS. I didn't have a Christmas tree for the past years - the pictures with the tree all lit and the kids tearing into copious packages was beyond words. My good friend came and decorated the tree with her daughter and it was really beautiful and the smell was wonderful. My children all barely make it financially and I do not let them give me presents for Christmas - they give me pictures in frames and nice things that do not cost much. I have not opened that many presents in years - so many useful things as well as frivolous and pretty things. I have thanked God over and over again and now I send you a heart felt thank you. I told my grandchildren we were visited by the Angel Gabriel - messenger from God. I am so grateful." Thank you, Miss F, for letting us be a part of your life. Miss N's story spoke to many of us at the Sparkle Foundation for a number of reasons: She reached out to us when so many mothers won't, she has a preemie and an older son, and she has overcome the many obstacles of her life with a smile on her face and the attitude that if you are kind and good, life will work out. "I am a single mother of two boys, 7 and 7 months. ... When I was pregnant this January, I had to call the police on my newest relationship because I was afraid of him ... We had met in a 12 step program (I have 8 years) and started dating, moved in, and got pregnant pretty quick. Soon after I learned I was having a high risk pregnancy, still working full time. I went into the hospital and had to have [my baby] due to severe preeclampsia. I was a deliver a 1 1/2 pound baby or we'd both die. We stayed in the NICU for 90 days in San Francisco. He came home on a feeding tube in late May. Thankfully my one pound miracle is now doing well at 13 pounds. And his brother is as sweet as can be with him. I am struggling with no support from the baby's dad. He decided to start using while my son was fighting for his life that first week at the hospital so he's not involved. He's seen him a few times this last 7 months for an hour or so each. I don't have enough extra after daycare to even file for child support. Thankfully my oldest has a good dad and helpful grandpa, but doing this alone in an expensive county is hard." "I wanted to say thank you again, as I sit here covered in glitter from all the bows on the presents for my family... but I would expect you guys to leave some sparkle everywhere you go. It will be my goal to do the same. ...I've been feeling guilty that this was going to be the first year with no Christmas tree. But I knew my 'village' would make sure the boys had what they needed. Sparkle Foundation is now forever part of our world. I'm still in shock over the immense amount of giving and support. This is the first year I've ever reached out for support, but the situations that ensued and people reaching out for a way to help made it easier. I'm forever grateful for the support for baby's first Christmas and a magical Christmas for a little boy who still believes in Santa. I think now, I do too." "[K] a single mother of two who has been struggling and fighting to keep her head above water for the 8 years that I have known her. Like pretty much all mothers, her needs come well after her children. I cannot say when I have seen her with anything new for herself. The family recently had to move out of the home they had been in since the children were born. The rent went up, the space did not. Still [K] manages to keep her head up and her children strong. There is no doubt in my mind that she is an excellent and most deserving candidate." overcome with love and peace and happiness by these gifts. brought me hope and joy in a time when I was beginning to lose hope and joy. You have given us a Christmas, when there would have been almost nothing. this organization is a phenomenal place. to my children. Thank you!!!!!!!!!!!!!! Thank you!!!!!!!!!!!!!!! Thank you!!!!!!!!!!!!!!!!!!!!!!! want you to know how sincerely grateful I am to you for helping my family in this lovely way. Wishing all of you great joy and happiness and a very Happy Holidays!!!!" Thank you, Miss K, for all that you do for your family! We were so happy to make your holiday outstanding.